What to do and see in the Altea? Altea is one of the most picturesque places on the Levante coastline despite the fact that some of the more recent buildings have slightly damaged the special beauty and charm of this Mediterranean village. Alicante city is a half hour drive from Altea and Benidorm is just ten minutes away. Altea used to be considered as a the 'hippy centre' of the area attracting a large international community of artists and musicians. Nowadays, tourism has overtaken cultural activity although a small number of artists still live in the old part of the village. Altea is full of little white houses built on top of a hill overlooking the Mediterranean. One of the prettiest views of the village can be seen from a new promenade built from Albir beach (in the village Alfaz del Pí) to Altea port. There is a church at the top of the village which you can reach by going up the steep, narrow lanes. When you get to the top there is a small square with a several bars and restaurants, very popular with both locals and visitors, next to the church. There is a viewing point in the square with spectacular views over Altea bay and the Mediterranean. Below the old part of the village there is a small port, a pleasant promenade and a sandy beach with a playground for children. For those who prefer a more peaceful atmosphere you can reach a small beach with white pebbles and crystal clear water a short walk away along the Albir promenade. 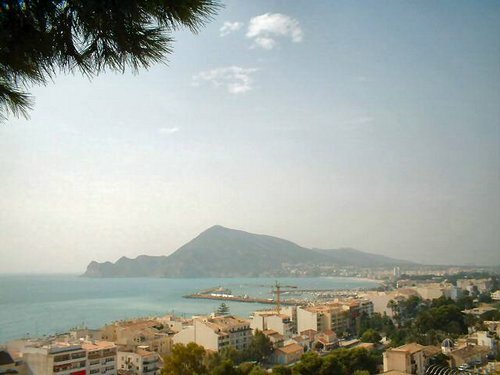 Altea, like Alfaz del Pí and Benissa, has a large number residents from other parts of Europe (mainly Germany, the United Kingdom and Nordic countries). However these villages have retained their originality while at the same time welcoming the new residents and their influence on cultural activities and gastronomy as well as the changing urban landscape. The Old Part: It is a pleasure to walk along the narrow lanes up to the top of the hill where you get fantastic panoramic views over the Mediterranean. Iglesia Virgen del Consuelo: The church presides the town and has a pretty blue dome typical in Mediterranean villages on the coast. The fishermen's quarters: The barrio de pescadores is in the lower part of the village. Fiestas in Altea: On the 15th August there are fireworks from Castell de L'Olla, and 'Moros and Cristianos' fiestas at the end of September. Also on the 16th July the 'marineras de la Virgen del Carmen' fiestas. Accommodation in Altea: Hotel Meliá Altea Hills Resort (*****): This is a luxurious hotel located on the mountainside with spectacular views over the coastline. Next to a golf course and near a marina. Well equipped with 55 bedrooms, 48 junior suites and 1 suite.